I’ve been reading BIKE magazine since the second issue. 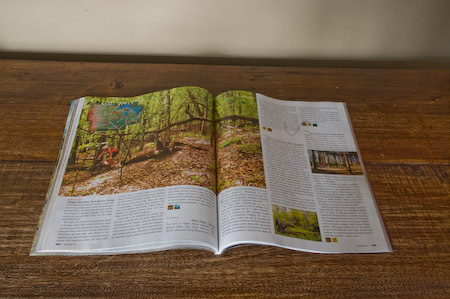 The two things that first attracted me to the magazine were Mike Ferrentino’s column and the photos; which were a huge step above any other mountain bike publication at the time. So I am proud to say that a photo I took will be appearing in the latest issue in the “50 trails” article. My friend Pete, who happens to be one of the trail bosses for the Murphy Hanrehan trail, was interviewed for the article since Murphy was to be the trail featured for Minnesota. When they asked him if he had any photos of the trail, he showed them a few pictures that I and some others had posted on the MORC and MTBR messages boards. Shortly after that I received an email from a Bike photo editor asking if I was interested in submitting some photos for the article. I didn’t have very many images of the trail but I sent off what I had, not expecting that any of them would be used. So I was pleasantly surprised when Pete sent me an email a couple of weeks ago telling me that they had used my photo.